10,000 miles (16,000 km) of track and more than 3,000 railway stations and depots. Railways, tramways, and-or rail transit systems. 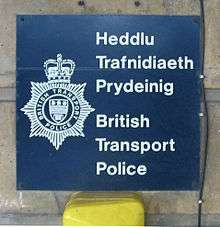 The British Transport Police (BTP) (Welsh: Heddlu Trafnidiaeth Prydeinig) is a special police force that polices railways and light-rail systems in England, Scotland and Wales, for which it has entered into an agreement to provide such services. 95% of the Force's funding comes from Britain's privatised train companies. British Transport Police officers do not have jurisdiction in Northern Ireland unless working under mutual aid arrangements for the Police Service of Northern Ireland in which case any duties performed on a railway will be merely incidental to working as a constable in Northern Ireland. This amounts to around 10,000 miles of track and more than 3,000 railway stations and depots. There are more than 1 billion passenger journeys annually on the mainline alone. In addition, British Transport Police in conjunction with the French National Police - Police aux Frontières - police the international services operated by Eurostar. It is not responsible for policing the rest of the Tyne and Wear Metro or the Manchester Metrolink or any other railway with which it does not have a service agreement; it can act as a constabulary for a transport system in Great Britain with which it commences a service agreement. A BTP constable can act as a police constable outside of their normal railway jurisdiction as described in the "Powers and status of officers" section. As of 2015, BTP has 2,972 police officers, 247 Special Constables, 323 Police Community Support Officers, and 1,533 civilian staff throughout Great Britain. In terms of regular officer numbers this means BTP is the 19th largest police force in England & Wales and Scotland in comparison to the 45 territorial police forces of Great Britain. Since March 2014, the Chief Constable has been Paul Crowther OBE. BTP has appeared on UK television in Railcops. From 1 April 2014 the divisional structure changed from the previous seven division structure to a four division structure - according to BTP this new structure will 'deliver a more efficient Force, generating savings to reinvest in more police officers across the railway network'. Based in Camden Town, London. This division retains overall control of the other divisions and houses central functions including forensics, CCTV and major investigations. As of 2015, 393 police officers, 10 Special Constables and 946 civilian staff are based at FHQ. Divisional Commander: Chief Superintendent Martin Fry. East - Sub-divisional Commander: Superintendent Richard Moffatt. Transport for London - Sub-divisional Commander: Superintendent Matt Wratten. South - Sub-divisional Commander: Superintendent Jason Bunyard. As of 2015, B Division houses the largest number of personnel of any BTP division: 1444 police officers, 101 Special Constables, 191 PCSOs and 361 civilian staff. Divisional Commander: Chief Superintendent Peter Holden. Pennine - Sub-divisional Commander: Superintendent Eddie Wylie. Midland - Sub-divisional Commander: Superintendent Allan Gregory. Wales - Sub-divisional Commander: Superintendent Andy Morgan. As of 2015, C Division houses the second largest number of personnel within BTP: 921 police officers, 112 Special Constables, 132 PCSOs and 180 civilian staff. Divisional Commander: T/Chief Superintendent John McBride. This division covers Scotland. There are no sub-divisions within D Division. As of 2015, D Division is the smallest in terms of personnel housing 214 police officers, 24 Special Constables and 46 civilian staff. Prior to 2007, there was an additional Midland Area and Wales and West Area however this was absorbed into the Wales and Western area and North Eastern area. The first railway employees described as "police" can be traced back to 30 June 1826. A regulation of the Stockton and Darlington Railway refers to the police establishment of "One Superintendent, four officers and numerous gate-keepers". This is the first mention of Railway Police anywhere and was three years before the Metropolitan Police Act was passed. They were not, however, described as "constables" and the description may refer to men controlling the trains not enforcing the law. Specific reference to "constables" rather than mere "policemen" is made by the BTP website article "A History of Policing the Railway" which states "The London, Birmingham and Liverpool Railway Companion of 1838 reports "Each Constable, besides being in the employ of the company, is sworn as a County Constable". Further reference is made by the BTP to "an Act of 1838...which according to J.R. Whitbread in The Railway Policeman was the first legislation to provide for any form of policing of the railway whilst under construction, i.e. to protect the public from the navvies more or less." The modern British Transport Police was formed by the British Transport Commission Act 1949 which combined the already-existing police forces inherited from the pre-nationalisation railways by British Railways, those forces having been previously formed by powers available under common law to parishes, landowners and other bodies to appoint constables to patrol land and/or property under their control. This is distinct from the establishment of a police force by statute, as applicable to the Metropolitan Police in 1829; BTP did not have jurisdiction on a statutory basis until the enactment of the Transport Police (Jurisdiction) Act 1994, which was subsequently amended by the Railways and Transport Safety Act 2003. Some early 19th century references to "railway police" or "policemen" do not concern constables but instead describe the men responsible for the signalling and control of the movement of trains (it is still common colloquial practice within railway staff for their modern equivalents in signal boxes and signalling centres to be called "Bobbies"). These personnel carried out their duties mostly in the open beside the track and were often dressed in a similar manner (e.g. a top hat and frock coat) to early police constables but were not directly concerned with law enforcement. Historical references (including those originating from the BTP itself) to when the first group of true "constables" was organised to patrol a railway should be treated with caution. This warning is repeated by the Metropolitan Police Service (MPS) web page dealing with MPS records of service which on the matter of records of other forces held by the Public Record Office (now the National Archives) states: "The occasional references to 'Police Department' in the railway staff records relate to signalmen etc. Although some were simultaneously County Constables." A huge workforce was required to build the ever expanding railway system. These armies of rough workers - navigators, or "navvies" for short - brought fear into rural Victorian England. The Special Constables Act 1838 was passed which required railway and other companies to bear the cost of constables keeping the peace near construction works. The continually expanding network of railways gave criminals new opportunities to move around the country and commit crime. The railways were pioneers of the electric telegraph and its use often involved the arrest of criminals arriving or departing by train. On 1 January 1845 a Railway Police Sergeant became the first person to arrest a murderer following the use of an electric telegraph. In 1838 the Royal Mail was conveyed by rail for the first time. The first mail thefts were reported shortly afterwards. In 1848 the Eastern Counties Railway lost 76 pieces of luggage in just one day, and by the following year thefts from the largest six railways amounted to over £100,000 a year. The first railway murder was committed by Franz Muller, who robbed and killed a fellow passenger on a North London Railway train in 1864. However Railway police were not involved in his apprehension. The first arrest abroad by the British Police was made in 1874 when a Metropolitan Police Inspector accompanied by a Railway Police Inspector went to the United States to arrest an embezzler. From 1900, several railway companies re-organised their police forces. The London, Brighton and South Coast Railway virtually reformed their police force from scratch in that year, followed by the Great Eastern Railway, the North Eastern Railway and Midland Railway in 1910, the Caledonian Railway in 1917 and lastly the Great Western Railway in 1918. Each had its own police force controlled by a Chief of Police. These four forces were organised in the same way; each split into a number of divisions headed by a superintendent, divided into a number of divisions posts led by an inspector. Detectives worked with their uniformed colleagues at most locations. Many 'non-police' duties were retained however, with officers acting as crossing keepers or locking and sealing wagons. During the war, the strength of the railway police doubled. With many men conscripted, special constables and women police were again employed. In 1947 the Transport Act created the British Transport Commission (BTC) which unified the railway system. On 1 January 1949 the British Transport Commission Police were created, formed from the four old railway police forces, canal police and several minor dock forces. In 1957 the Maxwell-Johnson enquiry found that policing requirements for the railway could not be met by civil forces and that it was essential that a specialist police force be retained. On 1 January 1962 the British Transport Commission Police ceased to cover British Waterways property and exactly a year later when the BTC was abolished the name of the force was amended to the British Transport Police. In 1984 London Buses decided not to use the British Transport Police. The British Transport Docks Board followed in 1985. The force played a central role in the response to the 7 July 2005 London bombings. Three of the incidents were at London Underground stations: Edgware Road (Circle Line), Russell Square and Aldgate stations, and the Number 30 bus destroyed at Tavistock Square was very close to the then Force Headquarters of the BTP, being responded to initially by officers from the force. In 1984 a Dog Section Training School was opened at the Force Training establishment near Tadworth, Surrey. In 2010, dog training was moved from Tadworth and the training school was moved to the Metropolitan Police’s Dog’s Training School in Keston, Kent. In May 2011, the Secretary of State for Transport Philip Hammond announced that British Transport Police would create an armed capability of its own with the added benefit of additional resilience and capacity of the overall UK police armed capability. The BTP are deployed on armed patrols using Glock 17 pistols, LMT AR-15 CQB carbines as well as tasers. The British Transport Police is largely funded by the train operating companies, Network Rail, and the London Underground – part of Transport for London. Around 95% of BTP's funding comes from the train operating companies. Other operators with whom the BTP has a service agreement also contribute appropriately. This funding arrangement does not give the companies power to set objectives for the BTP, but there are industry representatives serving as members of the police authority. The police authority decides objectives. The industry membership represent 5 out of 13 members. There is also substantial counter-terrorism funding from the Home Office. The police authority has agreed its budget for 2011/2012 at £250.2M. I...of the British Transport Police do solemnly and sincerely declare and affirm that I will well and truly serve the Queen in the office of constable, with fairness, integrity, diligence, and impartiality, upholding fundamental human rights and according equal respect to all people; and that I will, to the best of my power, cause the peace to be kept and preserved and prevent all offences against people and property; and that while I continue to hold said office I will, to the best of my skill and knowledge, discharge all the duties thereof faithfully and according to law. The attestation can be made in Welsh. Constables are required to take the oath referred to (but not defined) in s.16 Police (Scotland) Act 1967, which is in simpler form, merely declaring faithfully to execute the duties of his or her office. First Contact Centre: Based in Birmingham and responsible for handling all routine telephone traffic. This facility was created further to criticism by HMIC. Force Control Room – Birmingham: Based in Birmingham – alongside the First Contact Centre – and responsible for C and D Divisions which cover the East Midlands, West Midlands, Wales, the North West of England, the North East of England, the South West of England and Scotland. Force Control Room – London: Responsible for B Division which covers the South and East of England including Greater London (both TfL and Mainline). throughout Great Britain for a purpose connected to a railway or to anything occurring on or in relation to a railway. "Railway" means a system of transport employing parallel rails which provide support and guidance for vehicles carried on flanged wheels, and form a track which either is of a gauge of at least 350 millimetres or crosses a carriageway (whether or not on the same level). without a warrant, using reasonable force if necessary, and whether or not an offence has been committed. It is an offence to assault or impersonate a BTP constable. to assist him/her in the execution of their duties in relation to a particular incident, investigation or operation, a BTP constable also has the powers of the requesting officer for the purposes of that incident, investigation or operation. If a constable from a territorial police force makes the request, then the powers of the BTP constable extend only to the requesting constable's police area. If a constable from the MDP or CNC makes the request, then the powers of the BTP officer are the same as those of the requesting constable. If requested by the Chief Constable of one of the forces mentioned above, a BTP constable takes on all the powers and privileges of members of the requesting force. This power is used for planned operations, such as the 2005 G8 summit at Gleneagles. if they believe on reasonable grounds that they need those powers and privileges in order to save life or to prevent or minimise personal injury or damage to property. A BTP constable may only use such powers if he believes on reasonable grounds that if he cannot do so until he secures the attendance of or a request from a local constable (as above), the purpose for which he believes it ought to be exercised will be frustrated or seriously prejudiced. The policing protocol between BTP & Home Office forces set outs the practical use of these extended powers. "Other than in the circumstances set out under Mutual Aid, British Transport Police officers will not normally seek to exercise extended jurisdiction arrangements to deal with other matters unless they come across an incident requiring police action whilst in the course of their normal duties. Whenever British Transport Police officers exercise police powers under the Extended Jurisdiction Arrangements the BTP Chief Constable will ensure that the relevant Local Chief Constable is notified as soon as practicable." When policing the Channel Tunnel, BTP constables have the same powers and privileges as members of Kent Police. when in England or Wales, execute a warrant for committal, a warrant to imprison (or to apprehend and imprison) and a warrant to arrest a witness (from Scotland). When executing a warrant issued in Scotland, a BTP constable executing it shall have the same powers and duties, and the person arrested the same rights, as they would have had if execution had been in Scotland by a constable of Police Scotland. When executing a warrant issued in England, Wales or Northern Ireland, a constable may use reasonable force and has specified search powers provided by section 139 of the Criminal Justice and Public Order Act 1994. BTP uniforms are similar and the rank system identical to other British police forces. The distinctive black jerseys with a black and white chequered pattern on the yoke have been replaced with Black Windstopper fleeces. Officers in England, Wales and Scotland have now adopted the same uniform as the Scottish forces. A BTP constable does not lose the ability to exercise his powers when off duty. Section 22 of the Infrastructure Act 2015 repealed section 100(3)(a) of the Anti-terrorism, Crime and Security Act 2001 which required BTP officers to be in uniform or in possession of documentary evidence (i.e. their warrant card) in order to exercise their powers. The repeal of this subsection, which came into effect on April 12, 2015, now means BTP officers are able to use their powers on or off duty and in uniform or plain clothes regardless of whether they are in possession of their warrant card. On 1 July 2004 a Police Authority for the British Transport Police was created. BTP Officers became employees of the Police Authority; prior to that, they were employees of the Strategic Rail Authority. Until the 1990s the principal investigators of railway accidents were the Inspecting Officers of HM Railway Inspectorate, and BTP involvement was minimal. With major accidents after the 1988 Clapham Junction rail crash being investigated by more adversarial public inquiries, the BTP took on a more proactive role in crash investigations. Further reforms led to the creation by the Department for Transport of the Rail Accident Investigation Branch who take the lead role in investigations of accidents. The BTP operates several vehicles belonging to Transport for London's Emergency Response Unit (ERU), which responds to incidents on the London Underground network. The vehicles carry engineers and equipment to the scene of incidents. The partnership with the BTP began on a trial basis in February 2012, and initially involved three vehicles being fitted with blue lights and police markings. The partnership aimed to speed up response times to incidents where public safety is potentially at risk by using blue lights and sirens to allow the vehicles to force their way through traffic. The initiative came about after a report into the 7 July 2005 London bombings recommended that the TfL unit be permitted to use blue lights in order to respond to similar incidents more quickly, after a vehicle from the unit was dispatched to Edgware Road Tube station failed to arrive for several hours. This would have required a change in the law, which was not forthcoming, thus the vehicles were re-classified as police vehicles. The vehicles are driven by BTP officers, and once at the scene the officer performs regular policing duties in relation to any crime or public safety issues. The use of the blue lights on the unit's vehicles is subject to the same criteria as with any other police vehicle In December 2013, TfL announced that the equipping of ERU vehicles with blue lights and BTP drivers had halved the unit's response time to incidents. Similar schemes have been implemented elsewhere in the country, including a partnership with Network Rail and South West Trains (SWT) in which a BTP officer crews an "Emergency Intervention Unit", which conveys engineers and equipment to incidents on SWT's network using blue lights. The scheme won the "passenger safety" category at the UK Rail Industry Awards in 2015. Another "Emergency Response Unit" was established in partnership with Network Rail in the Glasgow area in the run-up to the 2014 Commonwealth Games. In May 2012, the BTP formed the Medic Response Unit to respond to medical incidents on the London Underground network, primarily to reduce disrutpion to the network during the 2012 Summer Olympics. The scheme was initially for a 12-month trial, and consisted of 20 police officers (18 police constables and two sergeants) and two dedicated fast-response cars. The officers attached to the unit each undertook a four-week course in pre-hospital care, funded by TfL. TfL estimated that around one third of delays on the London Underground were caused by "passenger incidents", of which the majority related to medical problems with passengers; the purpose of the unit is to provide a faster response to medical incidents, providing treatment at the scene with the aim of reducing disruption to the network. The unit also aims to assist passengers who may be distressed after being trapped on trains while an incident at a station is resolved. Its training and equipment is the same as that of the London Ambulance Service in order to ensure smooth hand-overs of patients. At the end of the trial period, in October 2013, the unit was reduced to eight officers; the other twelve returned to regular policing duties after TfL judged the results of the scheme to be less than conclusive. Officers from the unit treated over 650 people in the first year of operation, including rescuing a passenger who fell onto the tracks, and made 50 arrests. The BTP developed a firearms capability in 2011, upon agreement between the Transport Secretary and the Home Secretary and after an amendment to the Firearms Act 1968. Prior to this, BTP officers had to rely on assistance from the local territorial police force. Armed patrols began in May 2011, though the government stated that the development was not in response to any specific threat, and pointed out that it equipped the BTP with a capability that was already available to other police forces. 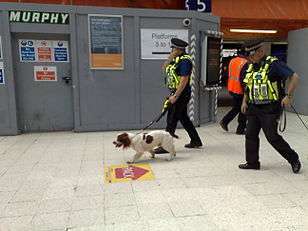 Armed officers were expected mainly to be deployed at major railway stations in London, comparable to the deployment of armed officers at airports, and occasionally on the London Underground as well as responding to incidents using armed response vehicles. The original procurement and training cost approximately £1.5 million and the BTP estimated ongoing training costs as £300,000 per year. Around 100 BTP officers were initially trained in the use of firearms. Operation Shield is an initiative by BTP to reduce the number of knives carried by passengers on the rail network. This initiative came about after knife crime began to rise and also because of the murder of a passenger on a Virgin Trains service travelling from Glasgow. In response a survey conducted by Transport for London, which showed that 15% of women using public transport in London had been the subject of some form of unwanted sexual behaviour but that 90% of incidents went unreported, the BTP—in conjunction with the Metropolitan Police Service, City of London Police, and TfL—launched Project Guardian, which aimed to reduce sexual offences and increase reporting. Route Crime collectively describes crimes and offences of trespass and vandalism which occur on railway lines and can affect the running of train services. It is a minor but significant cause of death on British railways. The overwhelming majority – 95% in 2005 – of deaths are suicides with the rest being attributed to trespass. Graffiti costs rail firms over £5m a year in direct costs alone. The BTP maintains a graffiti database which holds over 1900 graffiti tags, each unique to an individual. In 2005 BTP sent 569 suspects to court (an increase of 16% on 2004 figures). Surveys show that fear of crime is exacerbated by graffiti. The BTP deals with hundreds of instances of theft each day including stolen property and the theft of metals such as copper from railway safety equipment In the North West Area BTP has joined forces with Lancashire Constabulary and Network Rail to combat thefts of metals from railway lines in an initiative called Operation Tremor. The BTP established Operation Drum in 2006 as a national response to the increase in metal theft offences and also chairs the relevant Association of Chief Police Officers working group. 10 million offences of criminal trespass on the railways are committed annually by children. BTP has also worked closely with UK Border Force concerning theft or interference of freight at container terminals. BTP achieved 8 of the 12 operational targets for the year 2010/2011. British Transport Police first recruited Special Constables in a trial based in the North West Area in 1995, and this was expanded to the whole of Great Britain. Many Specials are recruited from the wider railway community and those working for train operating companies are encouraged by their employers. Under the terms of the Railways and Transport Safety Act 2003 and the Anti-terrorism, Crime and Security Act 2001, BTP special constables have identical jurisdiction and powers to BTP regular constables; primary jurisdiction on any railway in Great Britain and a conditional jurisdiction in any other police force area. British Transport Police Special Constables do not wear the 'SC' insignia (a crown with the letters SC underneath) on their epaulettes unlike some of their counterparts in some Home Office police forces. As of March 2015, British Transport Police Special Constabulary employed a total of 247 officers working across Great Britain: FHQ - 10; B Division - 101; C Division - 112; D Division - 24. The Special Constabulary has followed many home office forces in implementing a rank structure for Special Constables. This consists of a Special Chief Officer, two Special Chief Inspectors (one for B Division and one for C Division), and a Special Inspector and a number of Special Sergeants per Sub-Division. In Scotland, (D Division) they have a number of Special Sergeants. The BTP started recruiting PCSOs on 13 December 2004. The first of them went out on patrol for the first time on Wednesday 5 January 2005. They mostly work in the force's Neighbourhood Policing Teams (NPTs). Unlike most other forces, BTP is one of only three forces to issue their PCSOs handcuffs, the other two being North Wales Police and Dyfed-Powys Police. This is in addition to leg restraints. The issuing of handcuffs to PCSOs has been controversial. BTP PCSOs also utilise generally more powers than their counterparts in other forces. As of March 2015 BTP had 323 PCSOs throughout England and Wales: B Division - 191; C Division - 132. Although BTP polices in Scotland (D Division) it does not have any PCSOs in Scotland due to limitations of the Police Reform Act 2002, the law that empowers PCSOs which does not extend to Scotland. Although unlike police officers there is no formal transfer process. BTP is known to often attract PCSOs already serving in other police forces. One of BTPs PCSOs is credited with making the forces largest ever illegal drugs seizure from one passenger when on 30 September 2009 PCSO Dan Sykes noticed passenger James Docherty acting suspiciously in Slough railway station only to find him in possession of £200,000 worth of Class C drugs. PCSO Sykes then detained Docherty who was then arrested and later imprisoned after trial. Although the British Transport Police is not under the control of the Home Office, and as such was not included as part of the proposed mergers of the Home Office forces of England and Wales in early 2006, both the then London mayor Ken Livingstone and then head of the Metropolitan Police Sir Ian Blair stated publicly that they wanted a single police force in Greater London. As part of this, they wished to have the functions of the BTP within Greater London absorbed by the Metropolitan Police. However, following a review of the BTP by the Department for Transport, no changes to the form and function of the force were implemented, and any proposed merger did not happen. There are also ongoing proposals backed by the Scottish government for BTP's Scottish division (D Division) to be merged with Police Scotland. Scotland's Justice Minister has stated: "It's been the Scottish government's view that [transport policing] would be better if it was integrated into Police Scotland given that it would sit alongside our national police service." However, criticism of this proposal has risen due to lack of consultation including the effects on the future of BTP as a force as well as the continued specialist nature of railway policing should the merger go ahead. The proposal came about after it was recommended by the Smith Commission on further devolution & included in draft legislation with the UK Government stating "how rail transport is policed in Scotland will be a matter for Scotland once the legislation is passed". BBC News report that "BTP could become part of Police Scotland by the end of 2016". ↑ "British Transport Police (BTP) home". Btp.police.uk. 2014-02-12. Retrieved 2014-02-19. ↑ "About us". Btp.police.uk. Retrieved 2014-12-29. ↑ "s.3(5) Serious Organised Crime and Police Act 2005". Statutelaw.gov.uk. Retrieved 8 June 2009. ↑ "Office of Public Sector Information Railways and Transport Safety Act 2003 (c. 20)". Retrieved 17 July 2008. ↑ "BTP site "About Us"". Archived from the original on 15 December 2007. Retrieved 17 July 2008. ↑ "Chief Officers". British Transport Police. Retrieved 14 May 2014. ↑ "Production Company for Railcops". Filmsofrecord.com. 7 July 2004. Retrieved 8 June 2009. ↑ "A History of Policing the Railway" Archived 5 June 2007 at the Wayback Machine. ↑ "The Scottish Railway Police" Archived 29 May 2007 at the Wayback Machine. ↑ "Transport Police (Jurisdiction) Act 1994". Statutelaw.gov.uk. 24 March 1994. Retrieved 8 June 2009. ↑ "Explanatory Notes to Railways and Transport Safety Act 2003 – Background – paragraph 59". Opsi.gov.uk. 11 August 2003. Retrieved 8 June 2009. ↑ Metropolitan Police. "Metropolitan Police Records of Service". Met.police.uk. Retrieved 2014-02-19. ↑ "Sharpness Dock Police (1874–1948)". Retrieved 28 August 2007. ↑ "Transport police to be armed to counter terror threat". BBC- News website. 24 May 2011. Retrieved 11 December 2012. ↑ "Policing the railways - Armed police". British Transport Police YouTube channel. Retrieved 11 December 2012. ↑ British Transport Police Annual Report 2004/2005 (PDF). p. 8. Retrieved 11 April 2006. ↑ Ayling, Julie; Shearing, C. (2008). "Taking Care of Business: Public police as commercial security vendors". Criminology and Criminal Justice. 8 (1): 27–50. doi:10.1177/1748895807085868. 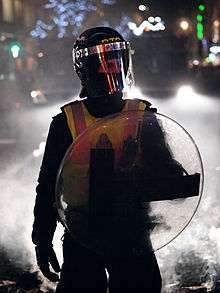 ↑ Police Authority Archived 29 April 2009 at the Wayback Machine. ↑ "HMIC – Baseline Assessment Project" (PDF). Retrieved 17 July 2008. ↑ "BTP – Control Room Project". Retrieved 20 January 2008. 1 2 3 "Railways Act 1993 (c. 43)". Opsi.gov.uk. Retrieved 8 June 2009. ↑ "Transport and Works Act 1992 (c. 42)". Opsi.gov.uk. Retrieved 8 June 2009. ↑ "Railways and Transport Safety Act 2003 (c. 20)". Opsi.gov.uk. Retrieved 8 June 2009. 1 2 3 4 5 "Anti-terrorism, Crime and Security Act 2001 (c.24) – Statute Law Database". Statutelaw.gov.uk. Retrieved 8 June 2009. ↑ "Anti-terrorism, Crime and Security Act 2001 (c.24) – Statute Law Database". Statutelaw.gov.uk. Retrieved 8 June 2009. ↑ "Channel Tunnel Act 1987". Statutelaw.gov.uk. 1995-01-04. Retrieved 2014-02-19. 1 2 3 4 "section 136, Criminal Justice & Public Order Act 1994". Statutelaw.gov.uk. Retrieved 2014-02-19. ↑ "Infrastructure Act 2015". legislation.gov.uk. ↑ "s18 Railways and Transport Safety Act 2003". Opsi.gov.uk. 10 July 2003. Retrieved 8 June 2009. ↑ "Incident response on the Tube to be boosted under 'Blue Light' trial". Transport for London. 9 February 2012. Retrieved 11 September 2015. ↑ Woodham, Peter (9 February 2012). "Blue light for Tube emergency teams". The Independent. Retrieved 11 September 2015. ↑ "BTP's rapid response vehicles get 'bluelights'". BBC News. Retrieved 11 September 2015. 1 2 "Tube medic team cut after 'less conclusive' pilot - BBC News". BBC News. 16 December 2013. Retrieved 11 September 2015. ↑ "Emergency vehicle for faster response to railway incidents". Network Rail. 19 March 2013. Retrieved 11 September 2015. ↑ "Prestigious national award win". British Transport Police. 24 February 2015. Retrieved 11 September 2015. ↑ "Police and engineer partnership to cut delays". Rail Technology Magazine. 19 March 2013. Retrieved 11 September 2015. ↑ "Joint Emergency Response Unit launched in Scotland". British Transport Police. 31 July 2014. Retrieved 12 September 2015. ↑ "Medically trained police officers to patrol Tube network". BBC News. Retrieved 11 September 2015. ↑ "Medically trained BTP officers deployed on the Tube - Transport for London". Transport for London. 21 May 2012. Retrieved 11 September 2015. ↑ Churchill, David. "Tube medical response team to be cut by more than half". London Evening Standard. Retrieved 11 September 2015. ↑ "Call for British Transport Police to be armed with guns". BBC News. 20 January 2011. Retrieved 21 September 2015. ↑ "Transport police to be armed to counter terror threat". BBC News. 24 May 2011. Retrieved 21 September 2015. ↑ Green, David Allen. "Why are we arming the British Transport Police?". New Statesman. Retrieved 21 September 2015. ↑ Millward, David (19 May 2011). "British Transport Police to be armed". The Daily Telegraph. Retrieved 21 September 2015. ↑ "Website: Man quizzed over stabbing 28 May 2006 (accessed 19 March 2007)". BBC News. 28 May 2006. Retrieved 8 June 2009. ↑ "Office of Rail Regulation". Rail-reg.gov.uk. 18 February 2008. Archived from the original on 26 September 2012. Retrieved 8 June 2009. ↑ 1 Archived 27 September 2007 at the Wayback Machine. ↑ BTP: Issues, graffiti (accessed 19 March 2007) Archived 6 February 2007 at the Wayback Machine. ↑ "Railway thieves risk their lives. TrackOff". Trackoff.org. Retrieved 8 June 2009. ↑ "Railways and Transport Safety Act 2003". Legislation.gov.uk. 2011-05-27. Retrieved 2014-02-19. ↑ "Archive collections". Btp.police.uk. Retrieved 2014-02-19. ↑ "PCSOs-national, the site for Police Community Support Officers across the UK". Pcsos-national.co.uk. Retrieved 2014-02-19. ↑ "S44/S60 Authorisations and PCSO powers. - a Freedom of Information request to British Transport Police". WhatDoTheyKnow. Retrieved 2014-02-19. ↑ "Prison for £200,000 drug dealer". BBC News. 29 January 2010. ↑ "Department for Transport – Review of British Transport Police undertaken by DfT 2005–2006". Dft.gov.uk. 19 December 2006. Archived from the original on 11 March 2007. Retrieved 8 June 2009. ↑ "Scottish force to police railways". BBC News. Wikimedia Commons has media related to British Transport Police. British Transport Police Special Constabulary website - Link no longer working.